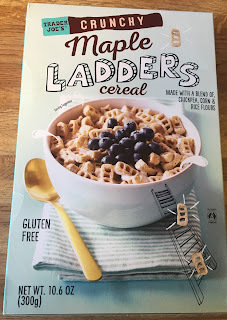 I'm sorry, but Trader Joe's Crunchy Maple Ladders Cereal does not, in fact, look like a bunch of mini bite sized ladders. Look at the cereal pieces. There is nothing ladderlike about them. The completed, enclosed ends negate any chance of them being able to reasonably be perceived as a ladder. It's three conjoined boxes smushed together. It's a segmented rectangle. It's a threepiece. It's not a ladder. Really, what these maple cereal bites more resemble...is cinderblocks. And not just in appearance. Okay, that's probably a bit harsh for the TJ maple ladder cereal. But I'm stuck at a place where I really want to enjoy them more than I actually can. 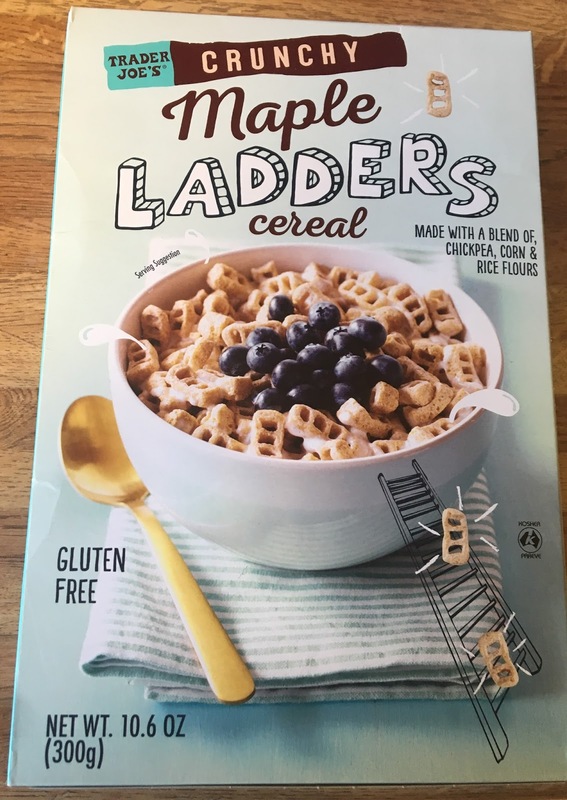 I LOVE the idea of maple flavored cereal. And as a glutenfree option? Even better! That's not a necessity for me but it is a preference. Yet the feel seems off. It's a bit too much of a dry, kinda blah crunch. Is it the chickpea powder's fault? I have no clue - have never had cereal made from chickpeas before - but the usual munchiness of corn and rice based cereal is missing, even though corn and rice are ingredients here as well. So I guess it's the chickpeas. Oh well, at least it didn't dissolve into hummus, I guess. The texture issue could be assuaded some if only the maple flavor was stronger. Unfortunately for this cereal, it's just a little too subtle and lowkey. Just a smidge more. I don't want to say a little sugar is needed, but I considered it. I liked what I could taste and wanted to taste it more, but instead was left hanging. In all it's a decent cereal I guess, but it's not what I hoped for. For funsies I did mix some with some cinnamon cereal, which made it all the more enjoyable...except any traces of maple flavor got wiped away. Sandy was similarly underwhelmed and wondered aloud if somehow the lack of gluten made a suboptimal flavor base for the maple to build on. Not sure if there's anything to that or not, but it's a theory at least. I'm more in the camp that a cereal that I wanted to be a little too junky is instead trying to be a little too healthy instead. I'm just going to have to deal with my disappointment, one step at a time. It from Australia!! So it Aussie cereal. Huh, too bad. Sounds like a great idea, and that’s certainly more protein and fiber than a dry cereal usually has (from the chickpea flour) but sounds like a pass.